Homebirth with Trillium Birth Services means working with a midwife who is constantly looking for ways to serve you better. I am a firm believer in pregnancy and birth as a normal process. Women are powerful. The best midwives should be guides through the birthing process, deferring to the woman's own knowledge of her body and her experiences. During the prenatal, birth, and postpartum care with Trillium, the midwives and apprentices take special care to consider the needs of the mama, the baby, and her whole family of loved ones. Home visits during the prenatal period help us to get to know partners, friends, extended family members, other children in the family, and even pets well so that when the birth comes the midwife and her assistants are familiar and welcome. 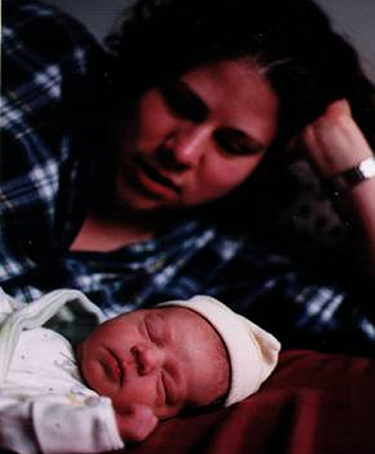 The quality prenatal care that midwives deliver is often an unexpected bonus of homebirth. Visits are in my office or your home and are usually an hour to an hour and a half. We discuss nutrition, the emotional impact of pregnancy and adding another member of your family, ways to keep your pregnancy healthy, and how to solve any unexpected problems that arise. I pride myself on providing thorough prenatal care and making sure that women and their partners have all the information that they need to make good informed choice decisions during their pregnancy and beyond. My bias is to provide low-tech care that relies on a woman's own knowledge of her body, but high-tech diagnostics are available to us if necessary. At the birth, I come and attend your labor when you are ready for extra support and bring in other care providers, like my apprentice and a second midwife, when labor seems well established. I am always thinking about the privacy and quiet preferred by many birthing families when thinking about who to add to the birth team. We try to provide an empowering, supportive environment so that women can do the work of labor. When your baby is born, we take special care to minimize separation of mom and baby and to treat the baby with gentleness. Our immediate postpartum routine is designed to facilitate bonding and breastfeeding and takes into account the ways that uninterrupted postpartum bonding helps reduce complications for both mom and baby. Postpartum visits are in your home and focus on how your new baby is changing the life of your family and how the experience of birth has impacted the family physically and emotionally. We talk about ways to take joy in the unpredictibility of babies and how to find new rhythms that help families be healthy and well after the addition of a new family member. Attentive postpartum care helps women achieve good physical recovery sooner as well. We love waterbirth! Many options available for birthing pools or tubs. Hands-off births -- moms and partners often "catch" babies, if they want to. Special attention paid to the baby's experience in the immediate postpartum period. Thorough prenatal care that draws on community resources to help you stay healthy. One primary midwife, so you can develop a strong relationship with a single person and qualified, well-trained assistants to provide extra help at births. Compassionate care from a midwife passionate about birth and midwifery. Home visits for the last two months of pregnancy, which saves time for busy families and helps the midwife become familiar to all family members. Expert breastfeeding support for nursing women. Comprehensive postnatal care, with frequent visits in the first two weeks after birth and a six-week follow-up. Services designed to be affordable -- we accept some insurance plans and employ an insurance biller. Sliding scale and extended payment plans also available.